Used in printmaking for spreading ink, however, these rollers can be used to spread thin layers of colour (oil/wax mixed) and for blending on the surface. If adding pigment, charcoal, graphite, shaved pencil or liquid to the design, the roller can be used to meld, mould and give texture to the surface. 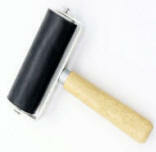 These rollers go by a variety of names:- Lino rollers; ink rollers; brayer (USA); seam roller and floor rollers. Silicon Blades, wedges, spatulas, dough cutters and bowl scrapers. 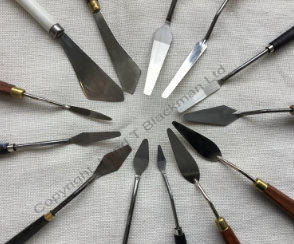 Neither a brush, nor a palette knife, these blades and wedges are excellent tools for moving Cold Wax and oil paint around, especially, where large volumes are repeatedly applied. Easy to use and to clean, particularly, useful for incising, patterning and scraping. Dough cutters and bowl scrapers come in a wide variety of shapes and materials, from plastic to silicon, very versatile. 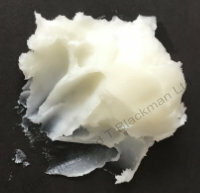 Good for removing areas of wax and solvent, additionally, use for pattern, texture and marking. Clay and Sculpting Tools can be made of plastic, silicon, wood, bamboo, steel and wire, primarily, used for shaping and modelling clay. They work exceptionally well with the Cold Wax Painting Medium and Oil paint. 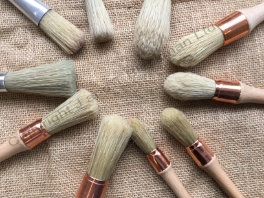 Colour Shapers - not a brush, nor a pencil, the Shapers come in varied of styles and states of hardness, the darker the colour of the tip the harder the material. Both types of tools are good for inscribing lines, chiselling shapes and defining marks.